I hope you've had a festive week of spirits and treats. I had ceremony and readings the latter half of the week. I had one impossible bonfire on a rain soaked day of the dead, and magical spreads during a mini psychic fair. It is easy to get bogged down in the mire of the mundane world. We forget the mysteries with frightening speed if we don't reinforce our dedication to them. Even I can get lured into a trance of the logical world, a Newtonian clockwork of drudgery and limitations. That's why it is important for me to force myself to get out and about to share my gifts with those outside the magical community. It is from the eyes of others that we sometimes get to see the depth of our own mysteries. This is why I do a few events each year. I had stopped for a while as they had never been particularly profitable, but value extends beyond the glimmer of coin. Years ago when I was the young reader on the scene, I considered myself pretty damn spiffy. At the time, I'd been reading for a decade nonprofessionally. Like any skill, the more you practice the better you get. It was only after going to fairs and meeting some others of the psychic persuasion that I began to doubt myself. You see their gifts fit neatly into categories. They were predictable, and seemed to be under their complete control. My gift remains to this day hard to define, and because of that I often doubt myself. In fact the more I try for specifics the less I seem to be able to see. 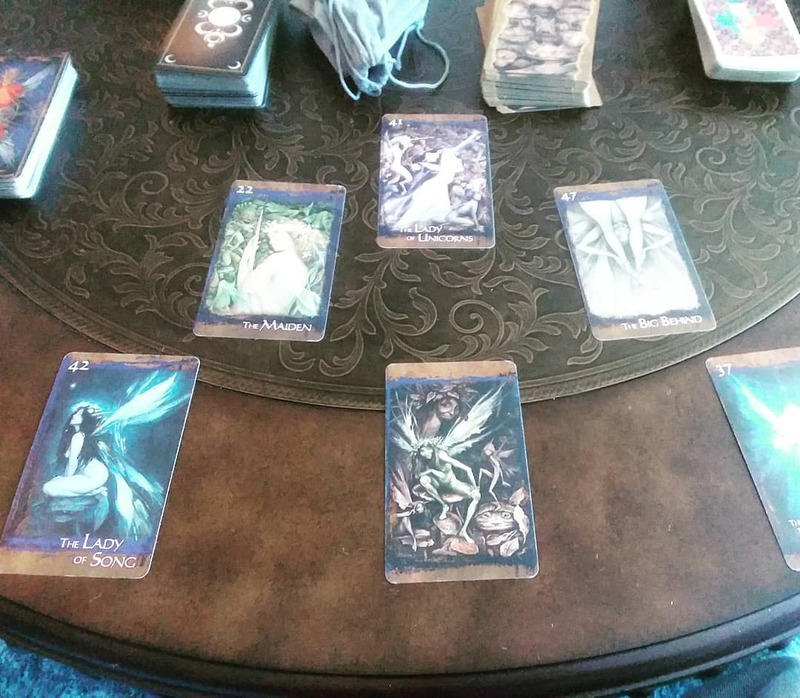 The more I let go, the more readings seem to flow and the more amazing details emerge. Of course I don't know when they emerge as they are just as likely to come through an offhand comment I make to someone as they are to come from my interpretation of a card or rune. To sum up, when I'm being the most psychic I may be the least aware of it. That has been the bane of my confidence for years. So the value for me participating in fairs for myself has been to restore faith in my intuitive faculty. I gave several readings this weekend that touched their recipients on a deep soul level. Their grateful reception helped me to remember that I am gifted and that I do provide value. That's a gentle reminder that I need in a society that tends to downplay the spiritual arts. Why am I telling you this? Well I think it is good to be honest about my own struggles with my self image. People often don't see the challenges others face within their own minds. We simply see the results. The fact is that many people see what I do as frivolous or they wish they had my job because it seems so easy or enjoyable. While it does sometimes flow well, oftentimes I use a great deal of focus and concentration to bring forth results. It can be an exhausting process, and I often have very little control over that process. I simply show up and do my best. How about you? Do you need a gentle reminder that your gifts are valid and valuable? Do you underestimate yourself? Do you share with others how much you value their skills? Well if you're in need of a refresher try sharing what you do outside of your normal haunts. See what is set loose when you are freed from the normal expectations. You may surprise yourself or simply remember the powerful being that you are.